Alicia Michelle is a musician from the northeastern Wisconsin area. The second of six children in her family, she began studying music in a Suzuki violin program at the age of four, when she also began taking piano lessons from her mom. At age six she began learning to play the mountain dulcimer and the clarinet (using a smaller-sized clarinet). By age seven she was an advanced player of the violin, mountain dulcimer, and clarinet and was composing her own music. At age eight Alicia Michelle began studying violin with virtuoso violinist Stéphane Tran Ngoc, who was a violin professor of the Lawrence University Conservatory of Music, and his wife, Arden Lambert of the Lawrence Academy of Music. She entered and won her first competition, the Fox Valley Youth String Competition, performing Praeludium and Allegro by Fritz Kreisler and competing against violinists who were all 3-5 years older than she. After studying with Tran Ngoc and Lambert for four years, Alicia Michelle studied under Dr. Samantha George, violin professor at the Lawrence University Conservatory of Music, for four years. She has also received violin instruction in individual lessons or master classes from Philippe Quint (Concert Violin Soloist), Yuliya Smead, (Concertmaster, Fox Valley Symphony), Rebecca Henry (Violin Professor, Peabody Conservatory), Rachel Barton Pine (Concert Violin Soloist), Janet Packer (String Department Chair, Longy School of Music), Darcy Drexler (Violin Teacher, String Academy of Wisconsin), Michael Keelan (Concertmaster, Green Bay Symphony Orchestra), Scott Conklin (Violin Professor, University of Iowa School of Music), and Clara Fenyo Bahcall (Violin Professor, University of Oshkosh). 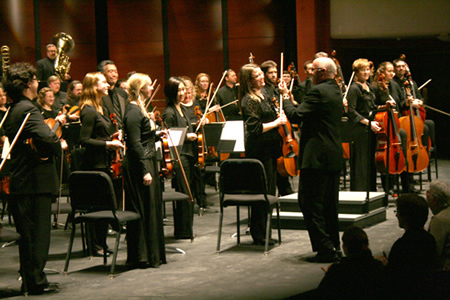 Alicia Michelle has been the featured soloist with several orchestras, including the Illinois Symphony Orchestra, the Fox Valley Youth Symphony, and the Civic Symphony of Green Bay. (See the video below of her performance with world-famous violinist Rachel Barton Pine at age 13, along with two other 13-year-old violinists.) She was a featured performer at the Fox Valley Symphony Season Opening Gala in 2011 at age 14, representing child prodigies. At age 14 she became a member of two professional orchestras, the Fox Valley Symphony and the Green Bay Symphony Orchestra, the youngest person ever accepted into both orchestras. She continues to play with two professional orchestras and often plays in chamber orchestras, quartets, and string trios. 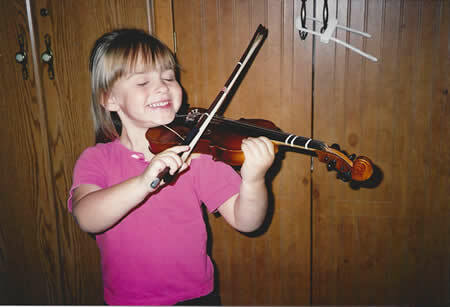 Although Alicia Michelle has extensive classical training, her mother insisted from early on that she be exposed to and learn a variety of playing styles so that, when she became old enough, she could decide for herself which type of violin she would like to play. As a result, Alicia Michelle has also received extensive training and experience in fiddle-playing, jazz violin and improvisation, and Christian violin music. Alicia Michelle has won numerous fiddle contests and, at age ten, was encouraged by a former member of the Grand Ole Opry to move to Nashville and perform on the Opry because, as he put it, “Anyone who can fiddle like that at age ten should be performing on the Opry!” But since Alicia Michelle was a bit too young to commit to a certain type of violin playing at that point, she and her family stayed in Wisconsin. However, at age 11 Alicia Michelle did accept an offer made to a small group of advanced fiddlers to study fiddling with Randy Elmore, world-renowned Texas swing fiddler, for a weekend. She was the only youth who was able to participate. Jazz and improvisation (making up music “on the spot”) have been a lot of fun for Alicia Michelle as well, and she has earned a very positive reputation for her improvisation. (See this page for a video of her being asked “on the spot” to do improvisation with Matt Turner at the Fox Valley Jazz Fest.) She uses her improv skills often as she plays what has become her favorite type of music, Christian contemporary violin music. Alicia Michelle has the unique ability of being able to hear a song—or even just part of a song—for the first time and “jump right in,” playing along with the artist and making up her part as she goes along. Alicia Michelle now performs with other Christian artists whenever she has the opportunity. She also writes her own acoustic Christian music and performs it on her own or with her siblings, who are also quite musical. She adds spice to her performances by incorporating the folk sounds of other instruments she plays, including the hammered dulcimer, mountain dulcimer, and mandolin. Jazz cellist Matt Turner invited Alicia Michelle to come out from a group of string players for an opportunity to improvise some Arabian music at the Fox Cities Jazz Festival when she was 14. Alicia Michelle enjoys performing all types of violin music, but she especially enjoys being a Christian violinist. She wants to use the musical gifts God has given to her to glorify him and to spread his Word, especially among 15 to 30-year-olds. She looks forward to following the Lord’s leading throughout her musical career!